AFC - 11/13/04 Vlatka Pokos is Shame for Croatia! 11/13/04 Vlatka Pokos is Shame for Croatia! 10/08/04 Circus YES, Animal Acts NO! 07/02/04 Circus YES, Animal Acts NO! 02/07/04 Let's Throw Away Primitivity! 01/24/04 Say NO to Fur! 01/15/04 Rather Go Naked Than Wear Fur! Motivated by the continuous practice of a famous pop singer and TV-host to promote animal fur in public, Animal Friends claims: Vlatka Pokos is shame for Croatia! With the stone age long behind us, in the world which strives towards humane fashion, with countries like Austria banning the production of animal fur, "best dressed Croat" Vlatka Pokos shamefully continues to add furs of skinned animals and feathers of exotic birds to her wardrobe. To show what they feel about the public promotion of this sort of crime against animals - killing in the name of beauty - on Saturday, November 13, 2004 at noon, on Petar Preradovic Square, in front of the building where Vlatka Pokos lives, Animal Friends will stage a protest and warn her that Croatia denounces the shameless and vanton promotion of fashion, not only a product of a senceless and utterly cruel killing of animals, but also ecologically unacceptable. 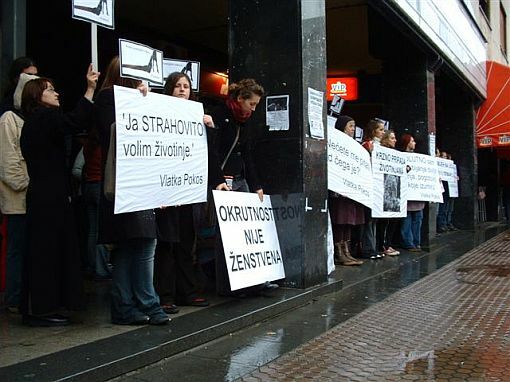 Despite the fact that the whole Croatian public is aware that Vlatka Pokos publicly praises her new fur coat every season, after the announcement that Animal Friends will stage the protest, she denied in the media that she owns fur coats, saying she has "just one" fur coat, and that the uninformed media created the perception that she has many. Furthermore, after the first critical reviews by the media concerning her new leopard fur coat, and motivated by the reaction of Animal Friends, she soon stated that it was a coat made of fur of a "plain lynx, refusing to reveal to the reporters the origin of the fur coat in dispute and the name of the producer. Apart from denying wearing leopard fur, she also claimed she had no coat made of 'endangered animals' fur." Although Vlatka Pokos denies wearing leopard fur and claiming it to be lynx fur, thus stating that there are animals which are more justified to be killed for fur than other animals, it is concerning that, inspite of having the option of personal (altruistic) choice, she justifies the wearing of coats made of fur and feathers of endangered animal species. Leopard, lynx, and the exotic bird marabu (Vlatka Pokos promoted a feathered coat this summer) score very high on the CITES (Convention on International Trade in Endangered Species of Flora and Fauna) list of endangered species, and their killing sanctioned by fines and prison sentences. Vlatka Pokos, being a consumer and promotor of the fur industry, directly justifies and supports the work of farmers and hunters, that being the killing and torture of animals because of fashion whims. Being a public person, who displays her attitudes through her public action, she has on countless occasions confirmed that she consumes the products of unethical and immoral origin and, therefore, deserves public judgment. Vlatka Pokos claims that she is unaware of the ways animals are killed for their fur, although we have given her on many occasions an informative leaflet from which she could obtain neccessary information. When, because of her statement of "not being aware," our representative handed her materials on fur last week, Vlatka Pokos refused to take them saying she "didn't want to see it." the fur industry not only jeopardizes human ethical principles, forcing them to make a living by killing innocent animals, but also puts human health at great risk - workers who refine the skins use cancerous trivalent and/or hexavalent chromium, which increases the risk of testicular cancer, while high levels of lead, cyanide and formaldehyde in groundwater around fur factories cause leukemia in local population! Animal Friends invites Vlatka Pokos, as a public person looked upon by others, to join many celebrities in the world, like Pink, Stelly McCartney, Kim Basinger, Joaquin Phoenix, and Goran Visnjic, thus proving that true beauty and glamour come from rejecting the crual and barbaric fachion of cavemen. In contrast, the modern civilization of the 21st century strives towards the promotion of humane values according to the time we live in.